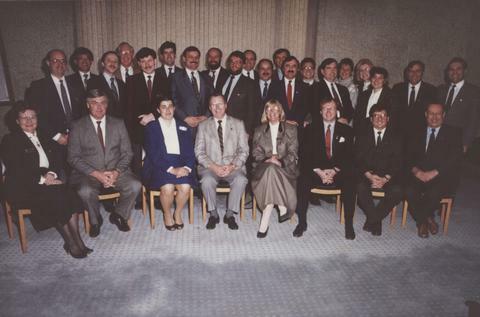 A photograph of the 1989-1990 City Council. Photograph shows: Mayor Bill Norrie and Councillors Rick Boychuk, Dave Brown, Bill Clement, Doreen Demare, Bob Douglas, Terry Duguid, Larry Fleisher, George Fraser, Ernie Gilroy, Al Golden, Peter Kaufmann, Marcel Laurendeau, Harry Lazarenko, Chris Lorenc, Christine McKee, Gloria Mendelson, Don Mitchelson, Glen Murray, Mike O'Shaughnessy, John Prystanski, Evelyne Reese, Greg Selinger, Lillian Thomas, Donovan Timmers, Shirley Timm-Rudolph, Roger Young, Joseph Yuen, Alan C. Wade. Photograph was taken in 1989 or 1990.